Thompson & Co. Public Relations team members (from left) Kailee Wallis, Brad Fleming, Abby Cooper, Nikkie Viotto, Shannon Sadler, Jennifer Thompson, Gary Scott, Meghan Aftosmis, Liz Baker, Stephanie Plieness, Ariel Walsh Amand, Kelsey Fielder and Emily McLaughlin work intently with their clients from offices in Anchorage, Houston and New York City. Thompson bought the business in 2009 with financial help from First National Bank Alaska. Building strong relationships and connections is key to what Thompson & Co. Public Relations does for its customers. That’s one of the reasons the company banks with First National Bank Alaska. With offices in Houston, New York City and Anchorage, Thompson & Co. CEO and president Jennifer Thompson said she considered the need to have a local banking connection in those Lower 48 cities, but thought better of it. Thompson & Co. recently celebrated the business’ nine-year anniversary. 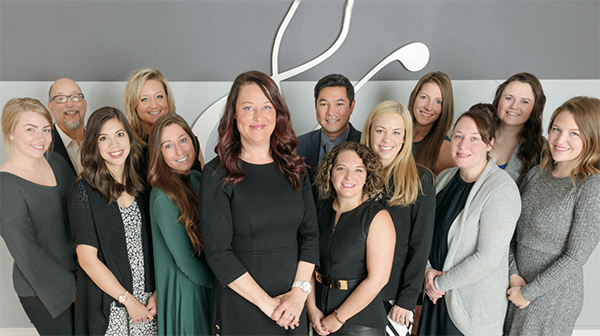 The national PR firm, currently with 19 employees, specializes in brand messaging, media relations, social media strategy, event coordination, crisis planning and more for a wide range of industries and non-profit clients. The company’s work reaches across the nation, and that’s no small feat. “Logistically, there are some hurdles dealing with the time zones,” Thompson said. “But today, we can do business in different states because of the trust I have in my talented team. We live in a digital, remote world. The ease with which she and her team can access First National’s online and mobile banking solutions no matter where business takes them is why Thompson values doing the company’s business banking with the bank and Vice President Melissa Reiser. Thompson traces her entrepreneurial spirit and fascination with media and storytelling back to her days growing up near Alaska’s renowned Homer Spit. As a young child, the principal partner, CEO and president of Thompson & Co. Public Relations sold bagels and other goodies to anglers and tourists visiting her hometown. At about age 13, she approached a photographer and his crew that had set up shop on the 4.5-mile stretch of land on the southern tip of the Kenai Peninsula. “The photographer was from National Geographic and told me he was there shooting a feature about the 10 most beautiful places in the world,” Thompson said. “I think Homer ranked ninth at the time. Regardless, I was fascinated by the work he and the crew were doing. As Thompson fell in love with PR, she first worked as an intern and then a full-time contributor at an Anchorage-based agency. Ownership of the agency changed hands once during her time there. It changed again when Thompson bought the business in 2009 with First National’s financing help. “When it came to understanding business, I was starting from scratch,” she said. “I considered myself a talented publicist. I like to think I became a really good businesswoman. Fast forward to 2012. Thompson & Co. had grown substantially in a relatively short time, allowing Thompson to search for a new location for the business. She received a phone call one day from an acquaintance who knew of an entire floor of space available in a building on Barrow Street in downtown Anchorage. “I was told the previous owner had defaulted on payments and the space was going to be sold quickly,” Thompson said. After visiting the site, Thompson felt the asking price for the space was too good to pass up. She quickly placed a call to Reiser, in need of a 90-percent guarantor letter and other paperwork fast. Reiser arrived on site shortly along with Betsy Lawer, who today is First National’s Board Chair and Chief Executive Officer. With business to tend to in Alaska as well as the Eastern and Central time zones, Thompson’s workdays usually begin around 5:30 a.m. with calls to and video conferences with employees in the New York and Houston offices. She strives to ensure everything Thompson & Co. produces exceeds client expectations. But since Alaska is where the company’s home office is located, she also takes great pride in dispelling myths about the state and way people here work. Thompson, Reiser and First National bankers are kindred spirits in that way. Visit thompsonpr.com to learn more about Thompson & Co.
Thompson and her team work each day with the luxury of their relationship with First National Bank Alaska backing them all the way. First National provides businesses like Thompson & Co. access to online and mobile banking solutions no matter where business takes them. “Whether I’m traveling around the country or right here in Alaska, the answers we need are often readily available to us in no time at all,” Thompson said. Business Online Banking: Enjoy easier navigation and more efficient access to expanded account information with our enhanced secure online business banking tool. Contact our business banking experts to get started. Mobile FNBizApp: Turn your smartphone into a high-powered business account management tool on the go with First National’s FREE FNBizApp. Check balances, pay bills, make transfers and so much more. Download the app from the iTunes App StoreSM or Google PlayTM. ONEpay: Originate and receive domestic and foreign wires and Automated Clearing House (ACH) payments online. Electronic Lockbox: Accelerate the collection of payments with First National’s customized lockbox solution. Deposit Advantage: Deposit high volumes of checks from your desk with high speed check scanners, lease ours or bring your own (supported models available upon request). Smart Data: Simplify your Corporate Credit Card expense reconciliation process through accounting software integrations. Also, gain greater transparency and control over spending and achieve improved card program compliance from staff. Talk with your local banker today about online and mobile solutions to manage your business finances anytime from anywhere. Regardless of the customer’s line of work, First National Vice President Melissa Reiser is always cognizant of the time and effort it takes to run a successful business. A First National banking expert since 2008, Reiser started working closely with Jennifer Thompson and Thompson & Co. Public Relations soon after she arrived at the bank. With a bachelor’s degree in finance earned in 1997, Reiser started her professional career in New Mexico. She has been a lender in New York, Alabama, Fairbanks, and Texas. She has gained expertise in Small Business Administration lending, land development, medical and construction loans. While working with all types of business customers, Reiser today specializes in finding banking solutions for the robust medical community. She can deliver fast, local decisions on business loans to help establish a new practice, purchase an existing medical practice, construct a new building, purchase equipment, establish working capital, purchase real estate, improve property, acquire practice equity loans and effectively use Mastercard® business and corporate credit cards. Reiser is currently studying at the prestigious Pacific Coast Banking School (PCBS). The school has partnered with the University of Washington for 80 years. In the three-year program, bankers attend two-week resident sessions each August on campus, complete five inter-session written assignments and author an original management thesis. PCBS focuses on risk management, financial performance, leadership and the entirety of banking. Reiser grew up in Anchorage and remains active in the community. She’s involved with Anchorage South Rotary, Anchorage Project Access and the Air Force Association.